I travelled on the train to London, with my ten week old and two year old little girls, having sent the removal van off from my home town of Swansea. We considered ourselves very lucky to have obtained a re-let house in Stevenage, attached by my husband’s job at the then British Aircraft Company. My husband met me off the train and we travelled what seemed a long way to Stevenage. It was August 1965, and we arrived in the evening, so I couldn’t really see our new house. We were gratified to find a fish and chip shop so close by, for our meal, and that night we slept on a mattress on the floor of the living room, one baby on either side. Next morning when we explored our new three bedroom semi-detached house and garden, we were in a seventh heaven, having left a very damp, one bedroom flat in an Edwardian terraced house in Swansea. My husband had chosen the house on his own, as it was difficult for me to travel up to Stevenage to see the property, both financially and practically. He had been living in Stevenage for ten months. And so we had been paying town rents, a total of £9.9s.6d of his £13 wages! I believe most women stayed at home, especially when they had young children, only going out to work when the children were off to school. I stayed at home a total on nine years as I had a son after my two daughters. When we became accustomed to the area in which were were to live, we considered ourselves blessed indeed: we had the local shops nearby and the Town Centre shops within 15 minutes walking distance, much needed convenience with two little ones. Near the shops was a large grassed area and the rabbits played there and burrowed beneath the high chain link fence. Not too far away we could walk into the countryside, and across to the Chells. One thing that was very different for me, coming from Wales was seeing washing out on the clothes lines on a Sunday. Wales was more religious and abhorred Sunday being made the same as other days. It was a day of rest and so no washing was done. 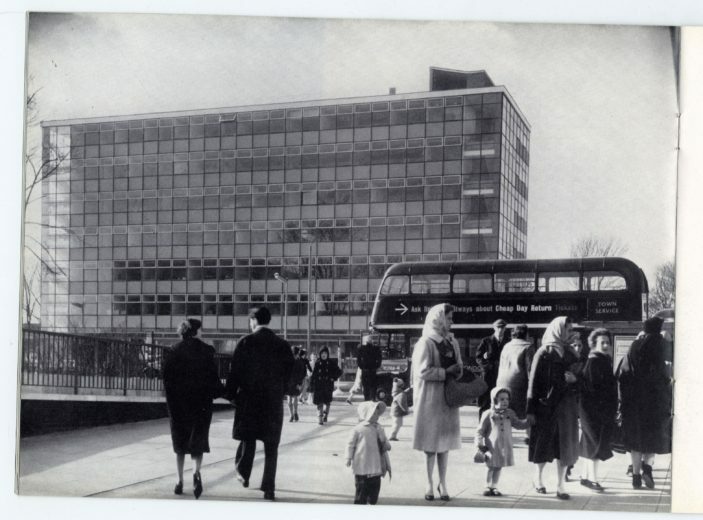 I suppose the reason it was done at weekends in Stevenage was that the people who had moved there from the so-called “depressed areas”, such as Wales, Ireland, Scotland and London, often needed to go out to work for companionship, as it was difficult becoming accustomed to a new place where there was no extended family just around the corner. We didn’t realise, being in our twenties, that we were groundbreaking pioneers, but, looking back it was quite had living the nuclear family existence with no Mum around the corner, or cousins and aunts to visit. Neighbours were more important, because of this. Over all, people like my husband and I who were given a the chance of a new life in a New Town, were very happy in our new place, on a practical level, but I think unconsciously, emotionally it was quite difficult, being so much thrown upon our own resources at such a young age. Grow up in stevenage in the 50s and 60s went to barclays school .